Maybe Elk County needs to make a new hire for its continuing road problems? Peru was the township seat of Belleville Township. Peru was founded as Belleville but early on had to change its name due to a name confliction with an existing town in Republic County. In those days, townships had sole responsibility for constructing and maintaining any road located within the township boundaries, including county or state highways where they existed. It would be another forty years, or so, before counties took over road responsibility. 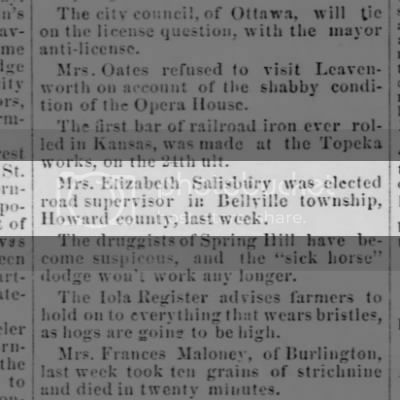 Marshall County News, Marysville News, Marysville, Ks, May 9, 1874.